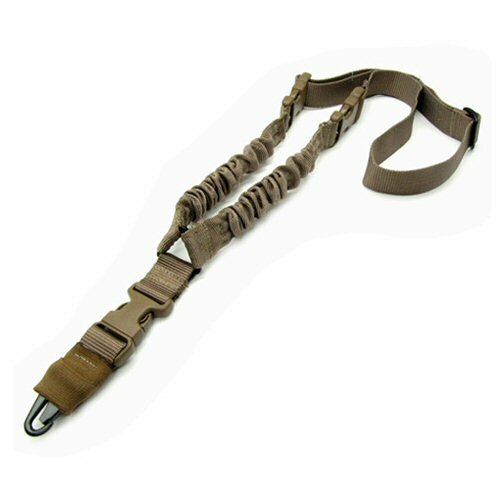 A single point tactical rifle sling with three point detaching points, made from thick 30mm, tactical nylon strapping. The use of nylon makes the fabric of the sling softer than MOLLE PALS webbing. The sling adjusts from 50cm length up to 67cm length (folded length from triangular sling point to the folded loop). The strapping is stitched down so that the sling cannot disassemble itself, even when at its longest adjusted length. The sling can be inserted into lead or antenna shrounds on the shoulder of a tactical vest (if present) to ensure the sling stays in place with the vest, and the quick release buckle on the part of the sling that connects to the bungee sections allows for the sling to be removed quickly without changing the way in which the strap is threaded into the vest. The bungee section is doubled up and folded over to ensure full support for the weapon. The extra extension capability aids movement and prevents the weapon from being temporarily caught or snagged. This is secured with four lines of stitching on each side and enclosed in a nylon shroud. The sling point on the bungee can be detached with a quick release buckle, and consists of a black powder coated, flat sprung carabiner hook which is enclosed with a retractable elastic. The sling is in dark tan colour, and matches well with tan webbing or MTP and multicam camouflage. The sling has multiple uses, and can also secure essential tools or utlities during adventurous activity.